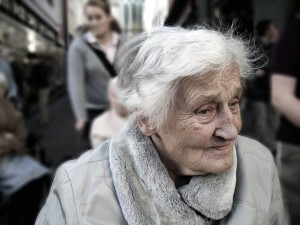 (CNA/EWTN News) In his general audience on March 4, Pope Francis condemned modern society for silently disposing of the elderly, saying that a civilization which views them only as burdensome is ‘perverse’ and ill.
“It is a mortal sin to discard our elderly…The elderly are not aliens. We are them – in a short or in a long while we are inevitably them, even though we choose not to think about it,” the Pope told pilgrims present in St. Peter’s Square for his March 4 general audience address. He recounted the story of how he visited a home for the elderly while still Archbishop of Buenos Aires, recalling how during the visit he stopped in front of one of the residents and asked her how her children were doing. When the woman gave a vague response, Francis asked if they visited often. When she said “yes, always,” the Pope said he questioned further, asking when they last came to see her. Pope Francis’ reflection on the elderly was part of his continued catechesis on the family, which he began last fall as a preparation for this October’s Synod of Bishops on the family. This week he focused on the role of grandparents. “The disposable culture considers the elderly as a burden, a weight, since not only do they not produce, but they also constitute a burden and, although not openly, they are discarded,” he told pilgrims. In contemporary times people tend to live longer thanks to advances in medicine, he observed, but cautioned that the human heart hasn’t necessarily extended to embrace the years added to life. “Often our societies not only fail to make room for the elderly, but even consider them a burden,” he said, explaining that the quality of a society can easily be evaluated by the way it treats its older members as well as the place it gives them in community life. Due to their increased vulnerability and unique needs, the elderly, especially those who are ill or alone, require greater attention and care, he said. However, rather than being a burden, such persons are what the Bible refers to as “a storehouse of wisdom,” the Pope said, and pointed to how the Church’s tradition has always placed great value on the elderly and devoted special attention to the final stage of life. Pope Francis encouraged attendees to remember well that “where the elderly are not respected, the youth have no future,” and called for greater solidarity between generations.